Put on a Santa suit and descend upon DC with thousands of like-minded Santas for the annual all-day Santarchy event! 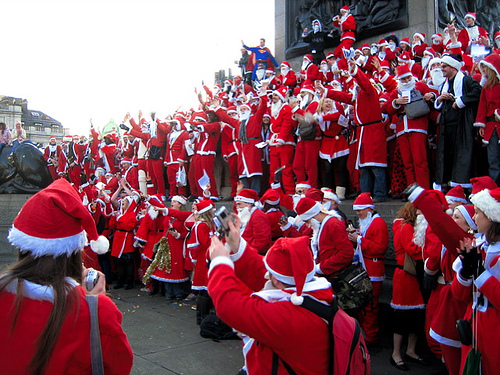 Santarchy/Santacons take place every year in major cities all over the world, involving tens of thousands of Santas. Santarchy is a non-profit, non-political, non-religious & non-sensical celebration of holiday cheer, goodwill, and fun. There is no good reason to dress up in cheap Santa suits, run around town, give gifts, sing songs, have strangers sit on our laps, and decide who is naughty or nice — but it’s a whole lot of fun — so Santa does it anyway. Starting point to be announced…check the Facebook invite for deets.